Leslie Hunt was witness to the building boom of the early 2000s in Whitefish as acres of open land quickly transitioned to new subdivisions. Areas where she once hiked just outside of town were being threatened by constant proposals for development. It was a proposed plan by the state in 2003 to sell off land on Spencer Mountain that ultimately spurred Hunt to take notice and action. Hunt, along with hundreds of other Whitefish residents, packed into a meeting room at Grouse Mountain Lodge to voice their concerns. As a result of that meeting, the Whitefish Neighborhood Plan and the A Trail Runs Through It Master Plan were born. Earlier this year, Hunt was named chairwoman of the Whitefish Legacy Partners board, the advocate group for the Whitefish Trail that works to secure open space and recreation easements around Whitefish. Hunt moved here in 1993 from Massachusetts after spending a summer working at the Flathead Lake Biological Station in Yellow Bay. “I fell in love with Montana,” she said. She found employment at Montana Coffee Traders that year and has been with the company since as the manager of three cafes. “Somehow, I figured out how to make a career out of coffee,” Hunt said. She has two daughters, ages 8 and 11, with her husband, Will Hunt. As an avid mountain biker, Hunt reflects on her early days in Whitefish and exploring the primitive trails just outside of town. “I used to bike all over Spencer Mountain, Lion Mountain and Haskill Basin,” she said. “Some of those open spaces we used to take for granted. 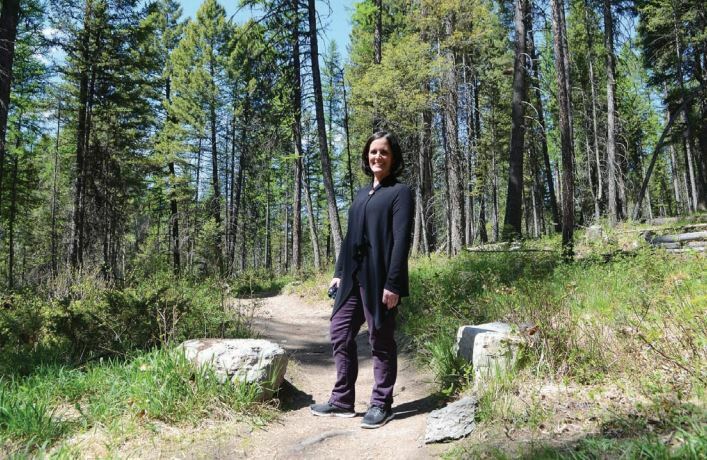 When there was that big growth, we realized that unless there is action to preserve those areas, they may not be there anymore.” She’s amazed at how far along the Whitefish Trail has come in a decade of work. “We went from a meeting at Grouse Mountain to now having 30 miles of trail,” she said. She said the scale of trail building won’t be as grand in the coming years as it was for the first four or five years of the project. “For every mile of trail, we need money to maintain those trails,” she said. Still, she says it’s important to remain flexible and take advantage of opportunities as they come up. Legacy Partners will make a big push this year to secure a recreation trail easement for Haskill Basin in concert with the 3,000-acre conservation easement that Trust for Public Land is developing with F.H. Stoltze Land and Lumber Co. The recreation easement will include a trailhead off Reservoir Road, a trail on the east side of the conservation easement and a trailhead off Big Mountain Road on Whitefish Mountain Resort property. Legacy Partners hopes to secure the recreation easement by the end of the year.